Sorry to frighten you. 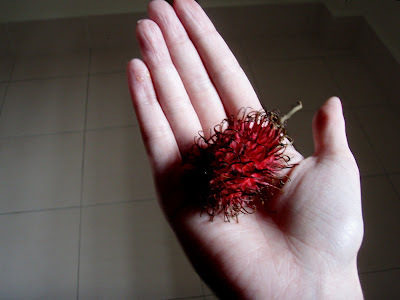 These are rambutans. Rambutans are a common fruit in Southeast Asia and you can find them all over the wet markets and grocery stores. These were given to me. I've never had the nerve to buy them. Because they're ugly. And they scare the bejesus out of me. I don't mean to be rude, but it's true. They're spiky and hairy. They also smell like nothing. I have a hard time trusting food that smells like nothing. Opening up the fruit doesn't help with my distrust either. It looks like an alien egg. Can't you just imagine seeing some pod person emerging from this thing in a few weeks? Nothing about this whole situation screams "Eat me." I was told that you must also avoid the seed in the middle. It either tastes bitter or does something bad to you. I can't remember. I was peer pressured to try one of these demon fruits at work. Shocking, I know. Those Singaporean women are relentless. They almost held me down and shoved it down my throat. Ok, not really. That's a lie. But I really didn't want to try it. Then they called me a silly American girl. That did it. I had to prove that I'm not silly. So I ate one...and I liked it. I really didn't want to like it either. It had the texture of a peeled grape and was even sweeter. It was quite nice. I think I ended up eating three or four. Then the hairy outside started to freak me out again and I had to throw the rest out. Like I said, I'm a work in progress. I need baby steps, people. After being in Southeast Asia for a year, I still have yet to try these things. I actually never even asked what they're called until just a few days ago when my wife and I were looking over a fruit cart. She said they're very good, but I wasn't sure I wanted to try them. I did try some star fruit one time, but after that I read on the internet that it can cause seizures and death, so I avoid them now. I've also had dragon fruit. That's not bad. I also like dragon fruit. It's pretty good. We only got star fruit one time here and it was so sour that we had to throw it out. We couldn't even eat it. Maybe that's why it can cause seizures. Ha. Dragon Fruit and star fruit are not supposed to be sour! Maybe the ones you got were bad or something. Ah, the dragon fruit I had wasn't sour, but the star fruits were. I don't plan on eating the star fruit again anyway though, not if they can cause seizure and death. Ditto on the previous commenter's advice: at that colour, it's really sweet. I've never heard that starfruit causes seizures! Hm. Mostly it's known round these parts as "cooling", that is, it soothes sore throats and the like. You can get it as boiled juice in bottles at the supermarket (from the same people who produce plum tea etc).